Matudnila.com - A Cebu Events Blog: First Cebu Blog Camp, Crafted for Cebuano Bloggers, on May 22, 2010! Home Tutorials First Cebu Blog Camp, Crafted for Cebuano Bloggers, on May 22, 2010! First Cebu Blog Camp, Crafted for Cebuano Bloggers, on May 22, 2010! The Organizer of the First Cebu Blog Camp is proud to showcase the event to the Queen City of the South, Cebu with Blogging, Expressions and Oppurtunities in mind. 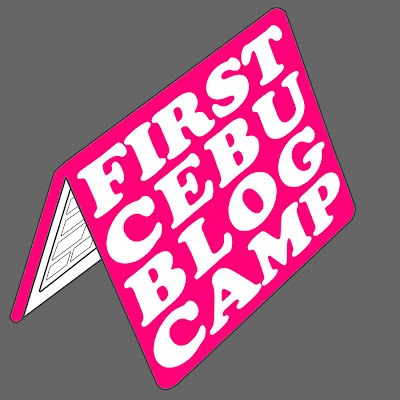 The First Cebu Blog Camp, an offline blogging event that focuses on honing the skills of bloggers while they are away from their desktops. This event will gather a large number of bloggers all over Cebu to discuss the latest developments on the Web, Blogging Platforms, Search engines, and making money online. Cebu Blog Camp can be consider as stepping stone for bloggers to aquiant more of the skill where it also aims to help those just beginning in their blog journey by giving them the basics of blogging. This Blog Camp will comprise of prominent speakers of the different fields of blogging. Through this event one can gain a learning experience on the different opportunities online. Apart from the discussions, one may be able to form a concrete network offline as one can finally meet the other bloggers of the community in Cebu. The registration to Cebu Blog Camp 2010 will start on April 5, 2010. Admission to the camp will be FREE of charge. Since we will only be offering 200 seats, registration is on a first come first served basis. Please see our registration guidelines first before proceeding. The Cebu Blog Camp 2010 is open to all bloggers and non-bloggers from Cebu City and its neighboring cities who wish to learn the basics and advanced skills in amateur and professional blogging. The event is FREE. Register Here. Cebu Blog Camp. The First Cebu Blog Camp posted on Cebu Events Blog! 8 comments: on "First Cebu Blog Camp, Crafted for Cebuano Bloggers, on May 22, 2010!" Register na Rox! its free! @Rox: cool! time to meet cebu bloggers offline. Thanks much. See you on May 22! yeah Clads, thanks to the brilliant minds behind Cebu Blog Camp. It promotes Cebu as a whole!